In recent months, a few examples of what State Sen. Joel Anderson (R-Alpine) has referred to as the California Department of Transportation's “continued pattern of abuse, theft and mismanagement” have become fixed in the public consciousness. First came news that 32 galvanized bolts meant to secure key seismic safety equipment on the Oakland span of the Bay Bridge had broken, and hundreds more were in doubt. Then a report from the independent state auditor's office found that Caltrans employees had systematically falsified bridge safety reports, thereby jeopardizing people's lives. Brown's review does not specifically focus, at least as of now, on how CalTrans has bullied its way into constructing a destructive and unnecessary $350-$500 million, six-mile freeway through Little Lake Valley, which would destroy the largest area of wetlands of any Northern California project in a half-century, and which a broad segment of local residents oppose (90 percent of Main St. business owners signed a petition opposing the project, for example). Although key Brown administration staff members have met about the project with Bypass opponents, as well as with CalTrans, his silence thus far on the topic reeks of sh-t just happening also. Redwood Valley resident Julia Frech, 30, decided a few months ago to examine the traffic data CalTrans used to justify the Bypass. 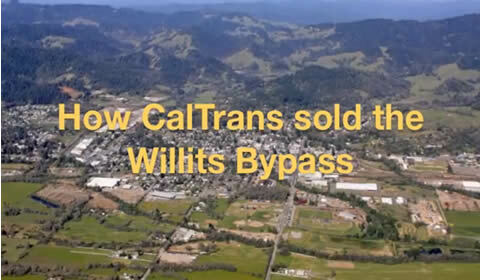 A few weeks ago, she released a concise, well-crafted video called “How CalTrans Sold the Willits Bypass” that focuses on the ways in which the project is based from top to bottom on misinformation. It is clear from watching Frech's video how the Willits Bypass is an extension of the corrupt culture to which Anderson was referring, and about which the Brown administration so far has been complacent. To understand Frech's video fully, it is necessary to know a little bit about the National Environmental Policy Act and California Environmental Quality Act process for vetting traffic engineering and construction projects. Each Environmental Impact Review requires a “Purpose and Need Statement,” which sets the stage for consideration of the project's alternatives. No environmentally damaging construction project can legally go forward without considering alternatives to the developer's preferred option. In 2002, Caltrans dismissed from serious consideration all two-lane options for the project. For instance, there is plenty of room on the already-existing Northern Pacific railroad corridor for both a two-lane bypass and the railroad. A two-lane alternative would have cost a fraction of the total of the freeway, while also having a fraction of the environmental impact. Yet, because two-lane roadways, by definition, have an extremely difficult time achieving “Level of Service C,” CalTrans was able to occlude them from consideration. In order to seal the case for a freeway, Caltrans had to ensure that any two-lane roadway would not achieve Level of Service C. They did so by artificially inflating their traffic volume figures, in ways that Frech's video explains in clear detail. Go watch the video at http://tinyurl.com/lpceqp5. Of course, people involved with opposing the Willits Bypass have been making many of the same points as Frech raises in her video for years. If common sense and responsible stewardship of public funds were actually the goal of government, the video alone should be more than enough to compel officials in Sacramento, Washington, DC, and Ukiah (by whom I mean the Mendocino Council of Governments board members) to withdraw their support for the project, or at least to order a new review of it. If you are unable to watch the video online, you can also catch it when a new speaking tour called “In Defense of Little Lake Valley: Stories From The Campaign to Stop The CalTrans Willits Bypass” rolls into a Mendocino County town near you. The first stop on the tour is the journalistic capital of Mendocino County — Boonville — this coming Monday, June 10th, at the Boonville Fire House at 6:30pm! I will be a featured speaker, as will Amanda “The Warbler” Senseman and Ellen Drell, founder of the Willits Environmental Center. There will also be public events in Ukiah on Thursday, June 13th at the Methodist Church from 7-9pm and in Laytonville on Friday, June 21st. Three stops along the Mendocino Coast are also planned. All of these dates will be announced in the AVA. For years, CalTrans has bullied the people of Willits into acquiescing to the Bypass for years. For much of 2013, the primarily Willits-based opposition has given Big Orange a big run for its money. People involved in organizing the campaign are calling on help from other areas of the county to help them sustain it and re-build momentum. If you are interested in doing so, or if you simply want to hear compelling stories and information straight from people who have been on the front-lines of this struggle, then this is your chance. Save Our Little Lake Valley is not affiliated with the “In Defense of Little Lake Valley” speaking tour. It will, however, sponsor a forum this coming Sunday, June 9th, at 12:30pm at the Little Lake Grange, 291 School St., called “Traffic, Tourists, Taxes, and Main St.: How Would the Bypass Change Willits?” Sheriff Tom Allman will serve as the discussion moderator.